(June 2013) – Have you ever experienced the loss of property due to the devastating effects of severe weather, such as high winds or flying debris from a storm or hurricane? When a powerful storm or hurricane strikes, building materials, trees and even lawn furniture can become dangerous projectiles hurtling through neighborhoods. Rebuilding after such a devastating storm is often a daunting task. One of the best ways to help protect your home is by adding heavy-duty impact-resistant windows and doors. An industry first, impact-resistant DecoGuard™ decorative glass windows by Hy-Lite® are a beautiful addition to any room and a smart first step in advance preparation for severe weather. 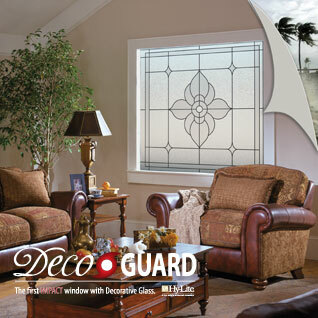 DecoGuard™ decorative glass windows add beauty, strength and durability to a new home or home renovation project. Why face high winds or flying debris without protection when you can prepare in advance by installing a stylishly strong impact-resistant window? Homeowners in many states across the country have installed impact-resistant windows, such as DecoGuard™ decorative glass windows by Hy-Lite®, to take advantage of insurance premium discounts. Thousands have benefitted from new insurance regulations in the wake of Hurricanes Katrina, Andrew, and Sandy. Be sure to check with your insurance company to see if it offers premium discounts. Working with their builder, homeowners in wind-borne debris regions or high velocity hurricane zone (HVHZ) areas now have an attractive alternative to sturdy impact-resistant safety windows. Hy-Lite® DecoGuard™ decorative glass windows are made of high impact decorative glass certified to meet the fenestration product hurricane impact testing specification AAMA 506-06 with a design pressure of DP 50, Level D/Wind Zone 4. The vinyl frame window is available in four designer colors -- white, tan, driftwood, and bronze -- and fits a 48” x 48” rough opening. If you are building a new home or looking to add a special design accent, talk to your trade professional about the industry’s first impact-resistant Hy-Lite® DecoGuard™ decorative glass windows. And, if you want a sneak preview, be sure to check out DecoGuard decorative glass windows on the Hy-Lite app that can be downloaded to your iPad or Android tablet from the Apple App Store or the Google Play Store. It’s good to know that you can weather the storm with style.